The adapter regularly executes its OnTask() method, which connects to the POP3 server and logs on, using a specific username and password. The polling interval is determined by the CallInterval setting. The adapter looks at all the messages in this mailbox and compares them against the match criteria. The adapter creates an instance of the %Net.MailMessage class and puts the email data into it. 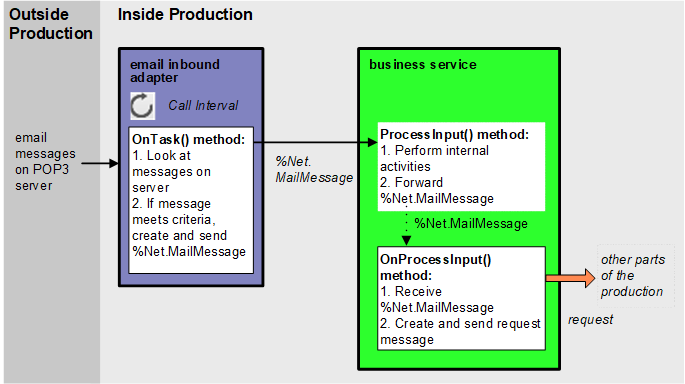 The adapter calls the internal ProcessInput() method of the associated business service class, passing the %Net.MailMessage instance as input. The adapter deletes the mail message from the server. In your class, the ADAPTER parameter should equal EnsLib.EMail.InboundAdapter. Studio provides a wizard that you can use to create a business service stub similar to the preceding. To access this wizard, click File > New and then click the Production tab. Then click Business Service and click OK. Note that the wizard provides a generic input argument. If you use the wizard, InterSystems recommends that you edit the method signature to use the specific input argument needed with this adapter; the input argument type should be %Net.MailMessage. Here pInput is the email message object that the adapter will send to this business service; this is an instance of %Net.MailMessage. Also, pOutput is the generic output argument required in the method signature. Examine the email message and decide how to use it. For the request message, set its properties as appropriate, using values in the email message. As noted earlier, after you retrieve an email message (%Net.MailMessage), you generally start by determining what kind of message it is and how to read it; that is, whether it is a multipart message and whether the parts are binary. In this step, you can use the ContentType property, which is equivalent to the Content-Type property. Or you can use the IsBinary, IsHTML, and IsMultiPart properties, which indirectly provide the same information as ContentType. A message has message headers; each part of the message can also have message headers. You can access the headers via various properties of %Net.MailMessage and %Net.MailMessagePart. For a multipart message, use the Parts property, which is an array of the parts. Use the Count() method to get the number of parts. Use the GetAt() method to retrieve a given part; the key for each part is an integer, starting with 1 for the first part. The message itself and each part of the message has a set of headers. The %Net.MailMessage class provides properties that give you the most commonly used headers. To  The list of email addresses to which this message was sent. This property is a standard InterSystems IRIS list; to work with it, you use the standard list methods: Insert(), GetAt(), RemoveAt(), Count(), and Clear(). From  The email address from which this message was sent. Subject  A string containing the subject for this message. Cc  The list of carbon copy addresses to which this message was sent. Bcc  The list of blind carbon copy addresses to which this message was sent. If the receiver of the message was on the blind carbon copy list, this property contains the address of the receiver; otherwise, it is null. ContentType  The Content-Type header of the message or message part. ContentTransferEncoding  The Content-Transfer-Encoding header of the message or message part. Headers  A multidimensional array that gives access to any additional headers. Also, you can use the GetAttribute() method. Given a header name and an attribute, this method returns the value of that attribute. The GetLocalDateTime() method returns the date and time when the message was retrieved, converted to local time in $HOROLOG format. The GetUTCDateTime() method returns the date and time when the message was retrieved, converted to UTC in $HOROLOG format. The GetUTCSeconds() method returns the date and time when the message was retrieved, in seconds since 12/31/1840. The HToSeconds() class method converts a date/time in $HOROLOG format to seconds since 12/31/1840. The SecondsToH() class method converts seconds since 12/31/1840 to a date/time in $HOROLOG format. Add an instance of your custom business service class to the production. In this example, hotpop is the ID of the production credentials that consist of the username isctest@hotpop.com and the corresponding password. Specify values for the following settings to control which messages to retrieve. Only messages that match all the given criteria are used. The matching is case-sensitive. If you change these criteria, the adapter will examine and possibly process messages that did not match the criteria before.